May 13, 2011 Angela G.
Back when I bought the ice cream attachment for my Kitchenaid standing mixer, I snagged a copy of the Ben and Jerry’s cook book at the same time. What a dream – in a sheer moment of atavistic delight, I poured through the book marveling at reckless abandon at which the recipes had been shared. And all before I’d actually made a single recipe in the book. Once I discovered that their cream base recipe was pretty damn close to the real thing, it was time to raise the culinary dead from the grave. 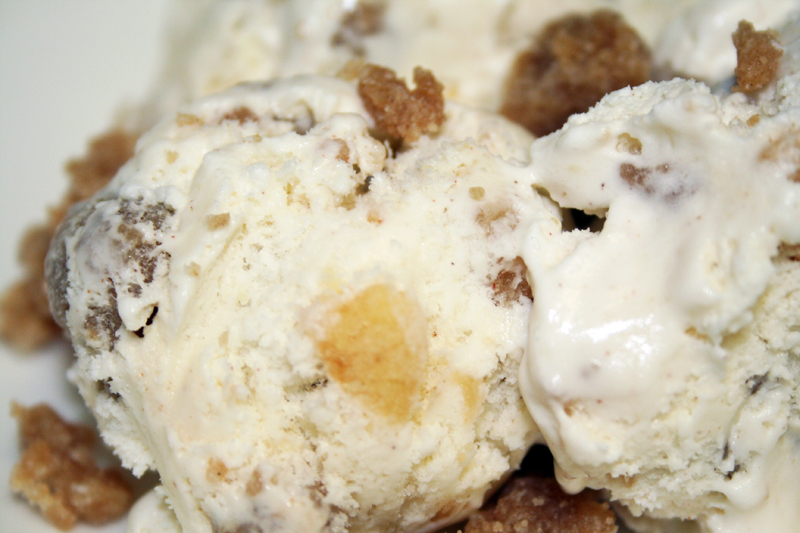 Many years before, I’d fallen in love with the Ben and Jerry’s flavor Apple Crumble. It was apple pie a la mode by the spoonful and nothing but goodness. Alas, the flavor was retired to the B&J graveyard and I was left in the lurch in terms of getting my Apple Crumble fix. After a bit of tinkering and some hoping and praying, I made my first batch of Apple Crumble knock off, and all I could do was revel in the results. It was ever so wonderful – a reminder that nothing in this life is ever truly lost. Preheat the oven to 350°. In a small bowl, mix the softened butter, sugars, cinnamon and flour with a pastry knife or a fork, forming large crumbs. You can also squeeze the mix into chunks with your fingers to form large crumbles. Bake in the oven on an ungreased cookie sheet until browned, about 15 minutes. Remove from the oven and gently crumble the mixture with a fork. Chill. In a skillet, melt the 1 tbs. of butter. Add the apples, sugar and cinnamon and saute until apples are tender. Set aside and chill. Begin making the ice cream base by beating together the eggs, cream, sugar and milk until frothy and lovely, about 5 minutes. Pour base into your ice cream maker and chill according to the manufacturer’s directions. 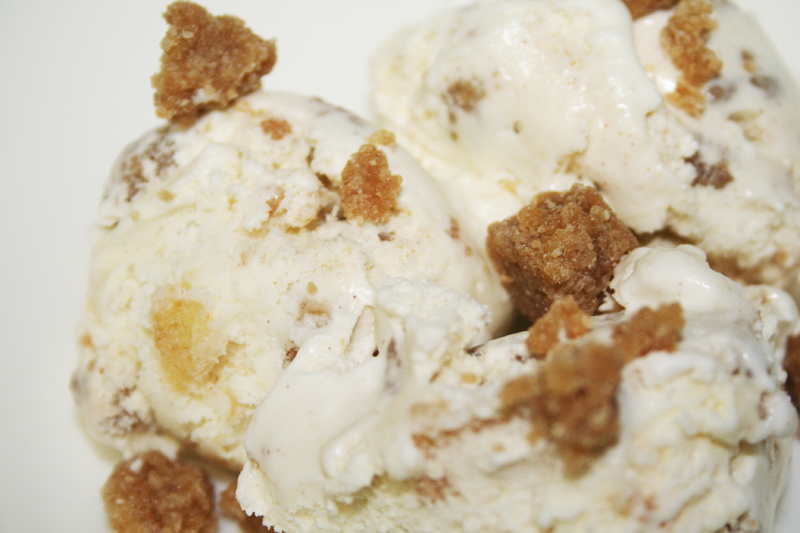 Once the ice cream has finished churning, fold in the chilled apples and crumbles. Transfer into an airtight quart container and chill. Eat with reckless abandon. 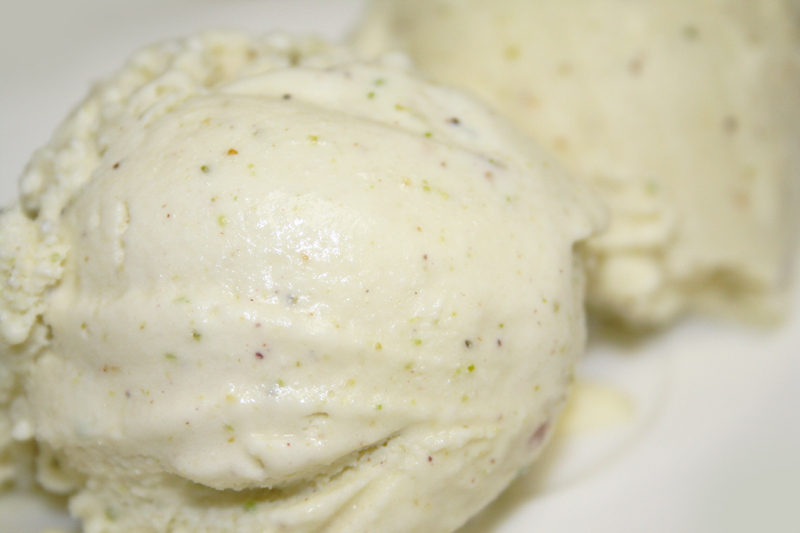 November 7, 2010 Angela G.
This recipe was born of a request from Dennis to whip up some pistachio ice cream without the actual whole nuts in it – just smooth pistachio goodness. As my brained churned with thoughts of embellishments and goodies to add to the ice cream, I thought, why not a cannoli? Ricotta, chocolate, pistachios and crispy fried pieces of dough all swirled together into some frozen majesty. Well, aside from the little bit of prep required, this one is deluxe and a sweet reminder of the Big Apple and splitting a cannoli on a date night. Maybe if I floated a scoop in a cup of espresso for a little Affogatto action, I’d be totally authentic! Despite its Italian leanings, this recipe is ice cream, not gelato – meaning that the richness of this dessert comes from butterfat in heavy cream rather than eggs cooked into a custard (similar to the preparation in my Basil Gelato recipe). The result is a quicker dessert – a good thing given that the components of the ice cream take a little time. No bother, though. The result is well worth it. Also, rather than mixing and rolling your own cannoli dough, I use pre-made wonton wrappers, fried and sprinkled with sugar and cinnamon. They end up tasting a lot like a waffle cone, which is novel and genius given the ease of the wontons. In a frying pan with high sides, heat an inch of oil. When smoking hot, drop in one or two wonton wrappers and fry until golden on both sides. Remove to paper towels to drain and repeat until all 5 are fried. Sprinkle with cinnamon and powdered sugar and set aside. In a coffee grinder, add your pistachios and mix until completely ground. Set aside. In a standing mixer (or with an egg beater), beat eggs, sugar and vanilla until frothy and golden. Add the heavy cream, ricotta, pistachios and milk and continue to beat until well-incorporated. Pour the mixture into an ice cream maker and prepare according to the manufacturer’s instructions. While the ice cream freezes, break up the wonton wrappers into small pieces and toss with the chocolate (I like to use Lindt Intensely Orange Dark Chocolate). Place in the freezer until you are ready to mix into the ice cream. Once the ice cream is just set, mix in the wonton pieces and chocolate and turn the mixture out into quart containers. Chill for a while if you like your ice cream a little stiffer, or eat right away. Nothing says summertime like a tall glass of fresh lemonade – or as the Baroness Shraeder said in The Sound of Music (one of my favorite movies of all time), “something long and cool, Georg?” This sorbet would have certainly captured their hearts on that gorgeous patio in Austria – pink, boozy and tart, full of just enough zest and sweetness to keep everyone happy. And yes, my dream job would have been to cater for the von Trapp family – those singing, dancing, curtain-wearing charmers have had my heart for a while now. I make this treat in an ice cream maker so as to give it lightness and creaminess, but if you’d like to enjoy it in a little more icy format (or if you don’t have an ice cream maker), you can absolutely make it as a granita. Once the base is made, rather than pour it into the ice cream maker, pour the liquid into a 13×9 baking pan. Place in the freezer and on 20 minute intervals, scrape up the ice crystals that form with a spoon. Keep on doing this until the entire mixture is icy and a gorgeous garnet color. Transfer to a plastic quart container until ready to serve. The optional shot of Absolut Açai, an Amazon superfruit that is the new feature flavor of Absolut’s vodka line, is there to enhance the rich, wild flavor of the blueberries. It’s absolutely optional, but a lovely addition. The berries should be whatever is cheap and good looking at the grocer or farmer’s market. Mix and match to your hearts content – this one is an absolute celebration of the season, and you can’t very well celebrate without the loveliest of fresh ingredients. In a small saucepan, bring the 1 c. of sugar and 1/2 c. of water to a boil. Stir to make sure that all the sugar has dissolved and then strain into a tupperware. Chill in the fridge. To a blender, add the sugar/water mixture, the lemon zest, lemon juice, vodka and 2 pints of mixed berries. Blend until smooth. Strain mixture into a bowl, pressing on the solids to get all of the pulp through and leaving just the coarse bits and the seeds. Cool mixture and then pour into an ice cream maker, following the manufacturer’s instructions. 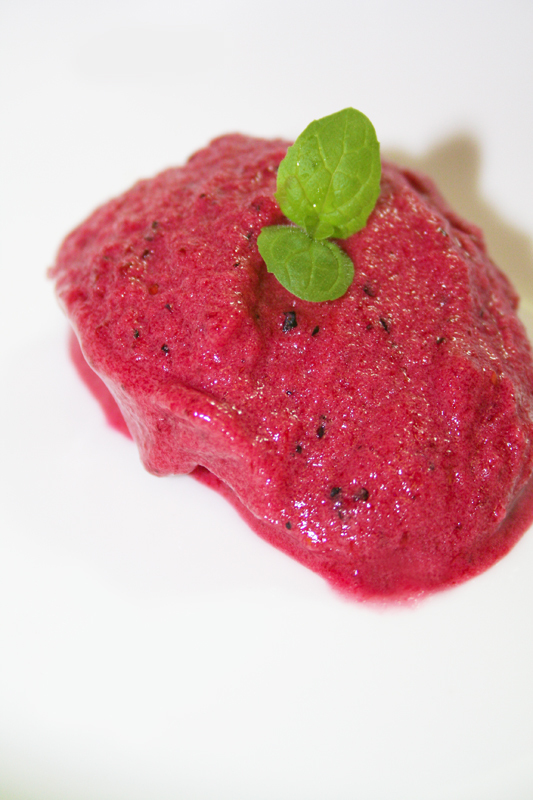 Remove sorbet to a plastic container and freeze until solid. Serve to your most creative of friends – like maybe the family of exceptional singers from Austria? June 1, 2010 Angela G.
Only my second foray into the fabulous world of fro-yo (the first being the currently unpublished recipe for Strawberry Fro-Yo that was consumed before the photo shoot could happen) and it’s some serious stuff. I love this recipe because it’s such a short list of ingredients that begets something so wholesome and lovely – not to mention that you could absolutely, positively never get this in the store. Brazileira that I am, of course I have a love for açai, a potent little superfruit found in the Amazon rainforest. Known for its energy jolt and wild blueberry flavor, it has gained quite a bit of a following here in the states as of late. It has also gained a slew of folks pronouncing the name incorrectly – as the daughter of a language teacher, I have to take this opportunity to give you a mini lesson. Say it after me, stressing every single syllable…AH-SIGH-EE. Not “ah-KAI” like some people would have you say. It’s AH-SIGH-EE. There, that wasn’t so hard. I get my açai from Whole Foods or online at Fresh Direct, but you can also get it at health food stores and sometimes even in the plain old supermarket in the frozen fruit section. If you have a choice, try to get the pure puree (say that 10 times fast) so that you can fully control the excellence of the ingredients that you are using. Begin by tossing the frozen blueberries with the açai puree, honey and lemon zest. Slice the vanilla bean in half with a paring knife and scrape all the black paste in the middle of the bean. Save the beans to flavor coffee grinds or sugar. Place the blueberries in the fridge to hang out while you prep the yogurt. Line a sieve with paper towels and place over a bowl. Add the yogurt to the sieve right on top of the paper towels and place in the fridge. Let the liquid from the yogurt drain off, about 2-3 hours or overnight. Dump the thickened yogurt into a bowl and discard the liquid that has drained off. 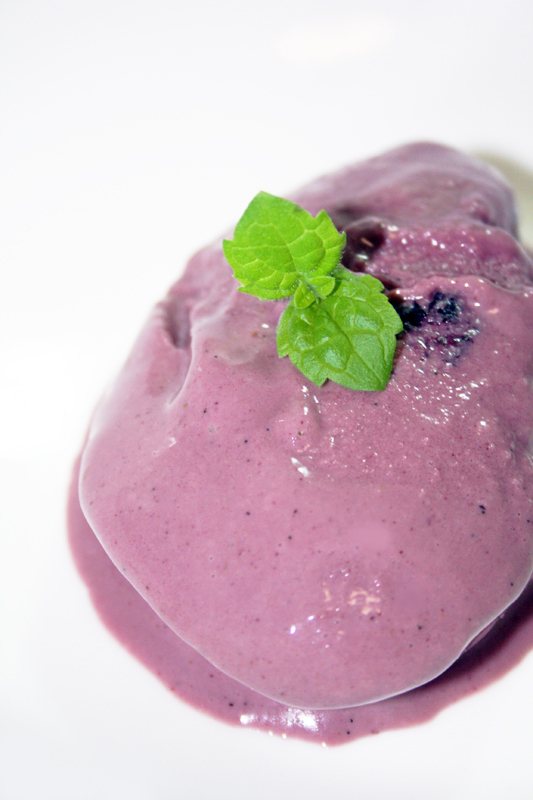 Drain the liquid from the blueberry bowl right into the thickened yogurt and set the blueberries aside. Whisk the yogurt/blueberry liquid mixture until smooth. Pour the ice cream base into your ice cream maker and follow your manufacturer’s instructions. In the last two minutes of mixing, pour in the blueberries. When finished, remove to a tupperware and freeze for a little bit to allow the ice cream to solidify a bit more. Serve. 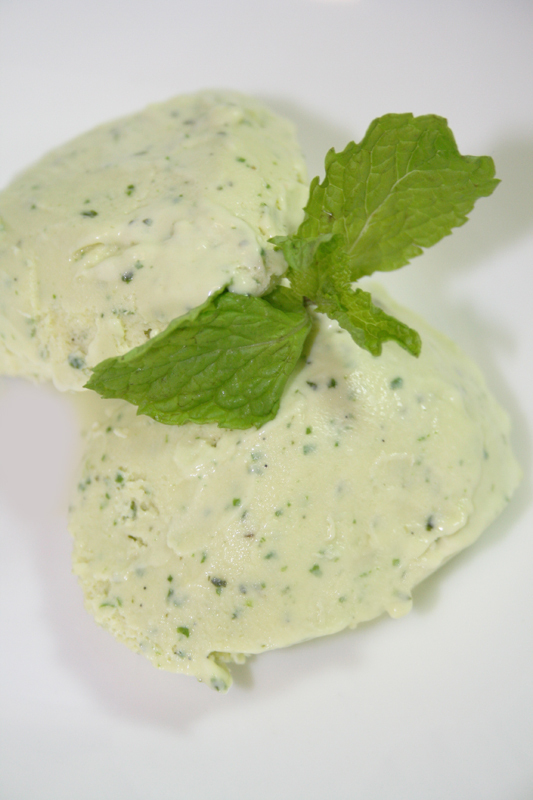 I decided to make a batch of basil ice cream because I am a fan of not only the glory of the celebration of the sweetness of basil, but mainly because of the polarizing nature of this dessert. It’s a love it or hate it kind of thing. Maybe for the folks that try it and hate it (my best friend Kate’s mom, Dennis eating Strawberry Fro-Yo and leaving all of this behind in the freezer), they’d need to give it a few chances. It’s different, yes. But it is so so very good. Eyes of wonder good. I first tasted basil ice cream at a special birthday dinner with my mom – I decided to take her to Tosca in DC for her celebration, just the two of us. She had fallen in love with the place after we took my sister there for her graduation celebration. The place is gorgeous – uber-minimalist and luxe, bringing your focus directly to the food. My mom is an August baby, so when we went, they were serving a special tomato menu, celebrating the glorious heirlooms available during that small window of time in the summer that you feast like a king, nay, a tomato demi-god. So what do they close the meal with? A sweet tomato tart with basil gelato. Go through the mental checklist with me: tomatoes and basil go together? Check. Tomatoes can be sweet? Check. Basil can be sweet? Check. It was a go on all counts. And kids, the final result was one etched in my brain on the short list of tastes I’ll never, ever forget. I swoon just remembering that very first bite. It was inevitable that I’d make it for myself someday, and once again inevitable that I’d share it with you. Definitely tuck into this with the tomato tart as well, if you want the full experience, but know that this is a treat all by itself. Bring a small pot of water to a boil. While the water comes to a boil, take a large bowl and fill with cold water and 6-8 ice cubes. Plunk the basil leaves into the boiling water and stir for about a minute and then drain and place into the ice bath to shock the leaves. Let them hang out in the ice water for a bit while you prep the creamy good stuff. In a heavy-bottomed saucepan, add the milk, heavy cream, sugar, and kosher salt. Using a paring knife, carefully split the vanilla beans in half and scrape the black pasty goodness in the middle of the bean into the cream. Add the whole beans to the milk as well once they’ve been scraped. Bring the mixture to a slow simmer, making sure not to let it boil. Once simmering, continue to cook for 2-3 minutes. Drain the basil leaves and add to a blender along with a cup of the hot cream mixture, making sure not to include any of the vanilla bean pods. Place the lid on the blender and a towel over the lid to prevent a hot, sticky splatter from the blended cream. Blend on high until smooth and then strain mixture back into the rest of the cream using a fine strainer or chinois. Set up a double boiler – you want a metal bowl for the top that fits over a pot on the bottom. You want to add enough water to the bottom so that it will easily boil without touching the bottom of the top pot. Wikipedia has a diagram of it that hilariously looks like it was drawn in MS Paint, but gets the point across. While the bottom pot of the double boiler is coming to a boil, work off the heat and take your top pot and separate 12 egg yolks into the bowl. Beat until pale golden and smooth and then slowly add a cup of the hot cream, whisking the entire time to keep the mixture smooth and prevent the egg from scrambling. Set the pot over the now boiling water and continuously whisk in the rest of the cream. Discard the vanilla pods, or clean them off and reuse them to flavor sugar or coffee – Marx Foods actually has a huge list of suggestions of what to do with the pods. Keep on whisking until the mixture thickens and the ice cream base can coat the back of a spoon. Turn off the heat. Strain the mixture into a large bowl and let the base cool in the fridge. Once cooled, pour the ice cream base into your ice cream maker and follow your manufacturer’s instructions. When finished, remove to a tupperware and freeze for a little bit to allow the ice cream to solidify a bit more. Serve to people with curious palettes looking to try a little something special.